Glasgow at the turn of the 20th Century was bohemian, and if it weren’t for early 19th Century Parisian bohemians, turn of the century Glaswegian culture would define the term. More to the point, Glaswegian culture, by means of Charles Rennie Mackintosh, defines architecture to this very day. 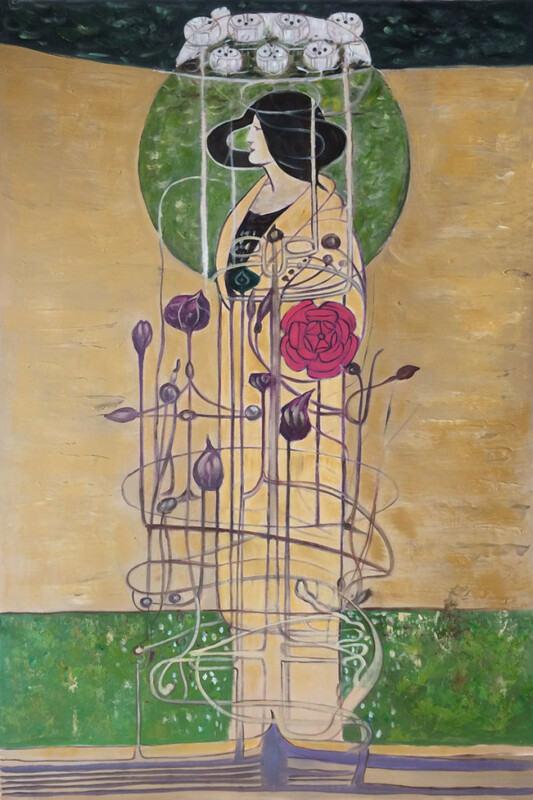 If you live in or around a city in Europe or North America which grew up before World War II, you see Charles Rennie Mackintosh everywhere, both in architectural design and in architectural embellishment, particularly the Mackintosh rose. You’ve seen that stylized rose everywhere, so much so that you probably don’t know you’re seeing it. Where did it come from, and how did it get such a wide distribution? This design, along with many of his design ideas, exploded into the arts and architecture world, as you might imagine happened if you study this specimen more closely, and perhaps if you study other specimens of the rose which he designed. All of Europe breathed a sigh of relief when that tension was released, and the relationship brought to bear by this explosion continued for twenty years, before Mackintosh succumbed to depression and tongue cancer in 1927. Architectural design throughout the western world had become sclerotic and quite formalistic, suppressing artistic expression and craftsmanship. There were signs of growth and creativity, with such notable patrons as William Morris, but those who were trying to create new schools of architectural design were confined to certain pockets, quite literally confined, bound by physical walls within which individual creative thinking might be encouraged, but, aside from certain trade magazines, such thinking was all moot. In these terms, the political bound the individual so that he could not express. If he expresses as he is compelled to express from within himself, he can expect to lose his ability to eat. Nevertheless, the Celtic revival movement was percolating, along with the English Arts and Crafts movement, but there was as yet no spearhead to bring the incredible talents into the larger professional world. Plenty of these artisans, however, were quite aware of their predicament, and they reacted quite predictably: they formed schools within schools. In 1889, Charles Rennie Mackintosh was introduced to one of these schools within a school while he was working as an assistant for an architectural firm. They were a group of young women attending art school who called themselves the Immortals. Frances and Margaret Macdonald were among this group, and they struck up quite a relationship with Charles and his colleague Herbert McNair. The four of them began to collaborate, becoming known to the outside world as The Four, and the outside world began to take notice. At first, their work was mocked and ridiculed, but, as they say in sports, “They don’t boo nobodies.” Something about their work had struck a chord and a nerve, so they were encouraged by the response. They received positive response to their work as well, from these other pockets of architectural bohemianism, particularly in Germany and Vienna. Being sensitive artist-types, however, they withdrew into a world of their own making, creating in their expressions a symbolic world whose interpretation is known only to the four of them. Soon, professional journals began to offer professional critique of their work, and they began to win prizes for submissions to open exhibitions. They gained no small notoriety throughout the architectural world as the principal representatives of the Glasgow School. They relied so heavily on distorted female figures, flowers, and tears that outsiders began to call the Glasgow School the “Spooky School.” The Four had triumphed, but, as a foursome, they had reached their zenith; individual expression was still subverted to the political, albeit only four of them. Moreover, Herbert married Frances and moved away, leaving Charles and Margaret to look at each other, shrug, and marry. Their collaboration was remarkable. 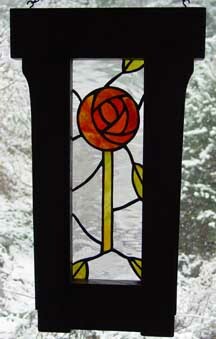 It was the rose, however, Charles’ Glasgow Rose, which he made his own, that revolutionized the architectural world. Mackintosh had found freedom within this little school within a school within a school, developing a language to communicate with them and only them so that only those whom he trusted most could advise, criticize, and encourage him. Within that conclave he gestated, and from that conclave he was born with a brand new rose in hand. For this post I leaned heavily on my repeated readings of John McKean’s Charles Rennie Mackintosh: Architect, Artist, Icon, and also Fanny Blake’s Essential Charles Rennie Mackintosh. Page numbers by request.